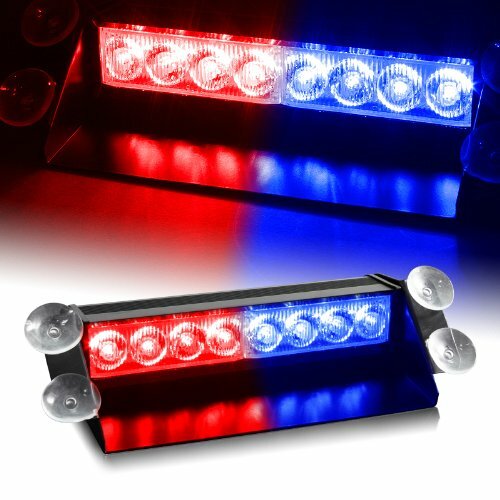 Home › Red & Blue Generation 3 Led Law Enforcement Use Strobe Lights For Interior Ro..
Red & Blue Generation 3 Led Law Enforcement Use Strobe Lights For Interior Ro..
Easy to install, Brackets and suction cups preinstalled, and plug into a 12V cigarette lighter. This item includes three modes of flashing / strobe. The first mode ( mode A )will flash one color / set 8 times and switches off to the other. Mode ( B )all lights at once. Mode ( C ) will flash all serveral times. Our Bright LEDstrobe lights are perfect for law enforcement, hazard warning, towing, andemergency needs.